Ford and Mazda engineered two generations of the Fiesta, shown, and Mazda2 subcompacts in Europe. New versions arrive in the United States next year. LOS ANGELES -- It's a little like the homecoming queen and the quarterback breaking up right before the big dance. Ford Motor Co. and Mazda Motor Corp. seemed like perfect partners, at least in terms of technology-sharing. But now Ford says the partnership is basically over following last year's divestiture of most of its Mazda stock. Yet there are two sides to every story. Mazda CEO Takashi Yamanouchi recently said Mazda is still going steady with Ford and the technical collaboration will continue. Who's right? It helps to look at how the relationship has evolved. Ford and Mazda have been helping each other for more than 30 years. The original Ford Courier compact pickup was built by Mazda. Then Ford ushered Mazda into the SUV segment with a two-door version of the Explorer called the Navajo. A version of the Ford Escape entry-level crossover -- loosely based on the Mazda 626 platform -- was given to Mazda, which called it the Tribute. But those were just rebadging exercises. The relationship deepened in the late 1990s when the two automakers created "centers of excellence." The resulting technologies were being applied to shared platforms in ways that most buyers could never tell apart. Ford cranked out V-6 engines for Mazda while Mazda developed zippy four-cylinder engines for Ford. The pinnacle of the relationship was reached when Ford, Mazda and Volvo co-engineered the C1 compact car platform in Europe. The resulting Mazda3, European Ford Focus and Volvo S40/V50/S70/C30 are shining examples of platform-sharing done right. 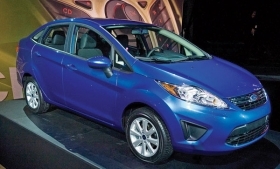 Ford and Mazda also have engineered two generations of the Fiesta and Mazda2 subcompacts in Europe. The latest version will arrive in the United States next year for both brands. The Mazda6 and Ford Fusion sedans and, separately, the Mazda CX-9 and Ford Edge crossovers share significant engineering and components while looking and driving nothing like their platform-mates. So, why would Ford want to break up with Mazda when things are going so well? The top r&d executive at Ford, Derrick Kuzak, and his counterpart at Mazda, Seita Kanai, began discussing more independent ventures last year when Ford cut its ownership of Mazda from 33 percent to 13 percent. But the change was under way two years before Ford reduced its equity stake in Mazda. Inside the engine bay, Ford is moving toward turbocharging with its EcoBoost engines while Mazda is aiming for direct injection with its Sky engines. Some Ford vehicles currently on Mazda-derived platforms are planned to shift to Ford-developed platforms, including the Escape and Fusion sedan. Mark Fields, Ford's president for the Americas and a former Mazda CEO, recently told Bloomberg: "For a lot of designing and engineering, we're going to be focused on Ford. Our efforts will be focused on the Ford system, as opposed to relying on others such as Mazda." That has analysts wondering whether Mazda can go it alone, despite a $1.1 billion share offering in the works. Ford remains Mazda's largest institutional shareholder. But Yamanouchi tells a different tale. In an interview at this month's Los Angeles Auto Show, he said the next-generation Fiesta and Mazda2 will likely be on an evolution of the current joint platform, which was developed largely by Mazda. "There is a lot of speculation," Yamanouchi said. "Ford divested last year because of their cash requirements. We still have regular meetings with Ford on strategic matters about how we share or do technologies in the future." Yamanouchi added that Mazda's small-car expertise, especially when it comes to weight reduction, is key to Ford's future. "There are still a lot of areas for us to contribute," he said. "Our relationship has endured because both sides feel benefits. The relationship has not changed." So if it seems like Ford is jilting Mazda at the big dance, the Japanese automaker may still have a few tricks up its sleeve. Ever see Mean Girls?